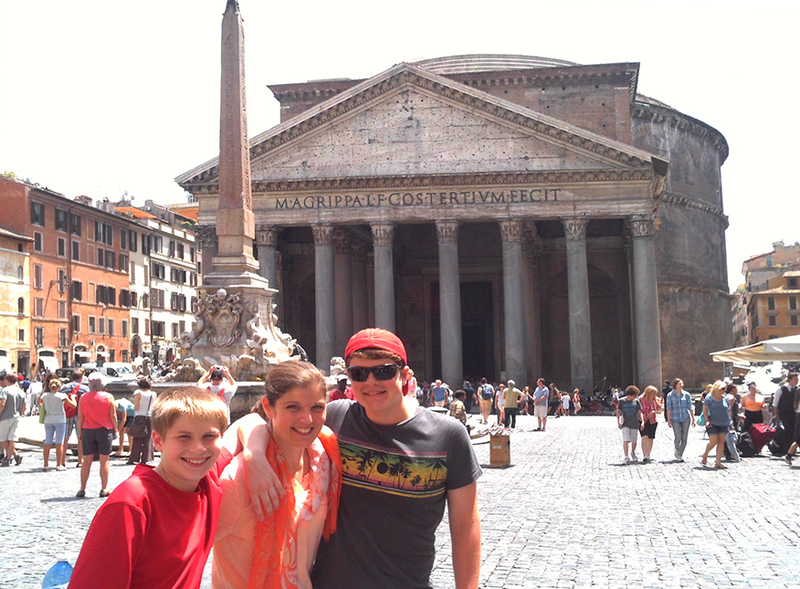 The Pantheon in Rome. Can you believe this was built in 126 AD?? My family is blessed to be a part of a “Vacation Club” that gifts us a vacation every year. Usually between 10 and 12 family members attend. Each time the destination is announced, we feel like the winners of the Showcase Showdown. We don’t deserve it– we get to go because we are family. (Any parallels come to mind?) This year was a bonanza– a Mediterranean Cruise starting in Rome and ending in Barcelona. Ever since my first course in Art History, I have wanted to see the Sistine Chapel. It was as awesome as I had hoped. What I was not expecting was the equally profound experience we had visiting the Sagrada Familia in Barcelona, a basilica started in 1882 and still under construction, and seeing a roadside sculpture in France of a Madonna and Child made entirely of bomb shrapnel. Throughout this trip, artistic genius was everywhere. Was it a little intimidating? Maybe. But not really. God has chosen to gift me with creativity and artistic ability, and experiencing the impact of the expression of the gifts that He has granted to others intensifies my desire to create that experience for others. Long ago, I abandoned the notion that I create art to make money. My deepest desire is that as a result of seeing my work, someone might be inspired to open their Bible, whether for the first time, or just the first time today.